Unfortunately, this event has been cancelled for 2019 due to Brexit tensions (yes it’s really that serious). Hopefully it will be back in 2020 – assuming we aren’t in a dystopian nightmare by then. 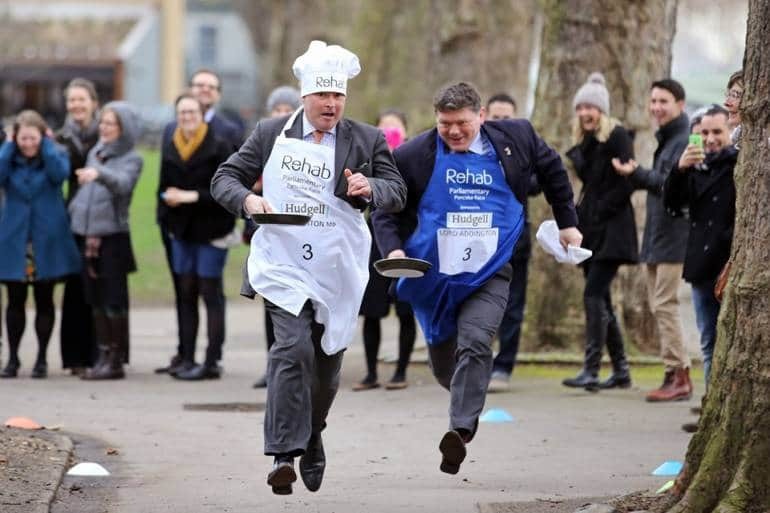 Thanks to the Rehab charity, pancakes and parliament now go hand in hand every February, and you can watch the competition from the sidelines! Every year, three teams compete in a pancake-flipping relay around the Victoria Tower Gardens to be crowned official champion. The teams are the Members of Parliament, the House of Lords and the members of the Parliamentary Press and all compete with a ferocity reserved for charity championships. The event is sponsored by Lyle’s Golden Syrup (fitting) and raises awareness of the work done by Rehab for people with disabilities and others who are socially excluded in the UK. You can watch the race for free and we encourage you to support Rehab before heading home to make your own pancakes!